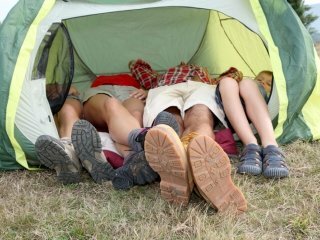 Camping is perhaps the most important family activity available in today’s busy urban world. Many families and children are growing up without exposure to the more basic world of the outdoors which is a critical component for perspective in modern life. Outdoor activities such as hiking, camping, and swimming allow kids and parents alike to enjoy the outdoors without the distractions of modern life. Even if you camp where there is phone coverage, put them AWAY, that’s right, the whole time! Camping is a family activity that allows us to get back to the basics of living. Vigorous activity like hiking, swimming, running and mountain biking, depending on your family interests, connect us back to the joy and freedom of life. Modern family activities often don’t allow time to sit and visit. Going to a movie or bowling is fun, but it doesn’t get you away from the business of life for that long. Camping life is much simpler than home life, and quite a bit of time camping is spent preparing food and eating, sitting around the campfire, and taking care of the very basic aspects of living. Camping provides kids not only with an enduring family activity, but with a different framework for life. Families who include camping trips to wild new places from a young age are building valuable skills and natural appreciation into their lives. Outdoor life tends to reduce work, food, exercise and nature to their simplest forms. If no hammer is available, the tent stakes are set with a rock, very simple, profoundly important. Look up the local natural attractions and make it a point to visit some or all of them as time allows. Camping shouldn’t be rushed, but it should include vigorous outdoor activities for everyone. Hiking, waterfalls, swimming, lakes, campfires, vivid shooting stars in the night sky and clean fresh air, this is what brings families together year after year and provides a lifetime of memories. Camping builds endurance and family identity. Embrace the rougher elements of camping and learn together how to make the best of a rainy day playing cards or singing in a tent. Take it slow at first, buy a tent and sleeping bags and spend a weekend somewhere within 2 hours drive from home. It’s spring and camping season is almost here. Where is your family camping this summer?